HTC U is in the news for past few months now, and we have seen a lot of leaks of the device that include the press render, the official introduction video and more. 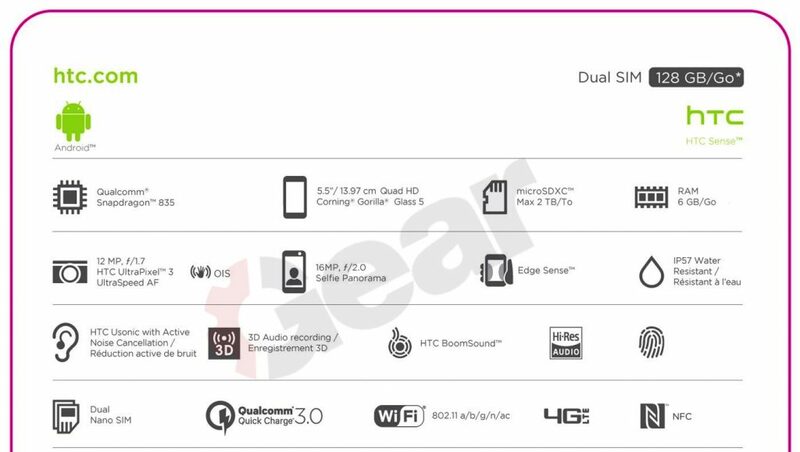 One of the things that were not known till now is the spec sheet and today, we have got the exclusive leak from MySmartPrice that reveals every single feature of the upcoming HTC U ( or U11). Some specs like the processor and RAM are already known from the previous leaks as the device was spotted on Geekbench a couple of days ago, but some other features like the touch-sensitive frame, etc. have been confirmed today. The phone is going to launch on May 16th, and the official box art of the phone reveals the specifications today. Snapdragon 835 processor powers the device with 4/6GB of RAM and 64/128GB internal storage that can be expanded up to 2TB. HTC U (U11) features a 5.5-inch Quad-HD display with the Gorilla Glass 5 protection on top. Android 7.1.1 runs out of the box with ‘Edge Sense’ that will let the user do various tasks on the phone by using the touch sensitive frame on the either sides. As we revealed before, the phone comes with IP57 certification which means it is water and dust resistant up to some limit. For the music lovers, this phone is going to be great as it features HTC Boomsound technology and Hi-Res Audio. Other audio features include HTC Usonic (Active Noise Cancellation) and 3D Audio Recording. Coming to the cameras, the phone features a 12MP UltraPixel 3 camera with f/1.7 aperture, OIS, and dual LED flash. There are chances that this camera has a Sony IMX351 sensor. On the front, the phone has got a 16MP shooter with f/2.0 aperture and Selfie Panorama feature. The phone is powered by a 3,000 mAh battery with Qualcomm Quick Charge 3.0 technology. It is a dual SIM device with features like 4G LTE (dual-SIM in some markets), GPS with GLONASS, dual-band Wi-Fi 802.11 a/b/g/n/ac, Bluetooth 5.0, NFC, and USB 3.1 Type-C. Overall, the phone has got high-end specifications, and it will be interesting to see the pricing as HTC always fails to price its devices right. What are your views? Would you buy the device for the specs that it offers? Do let us know via the comments section.